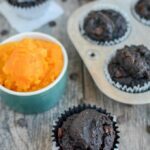 These Chocolate Squash Muffins can be eaten on the run for a grab and go breakfast and also make an easy, kid-friendly snack! Allow me to introduce you to the newest muffin recipe obsession in our house. 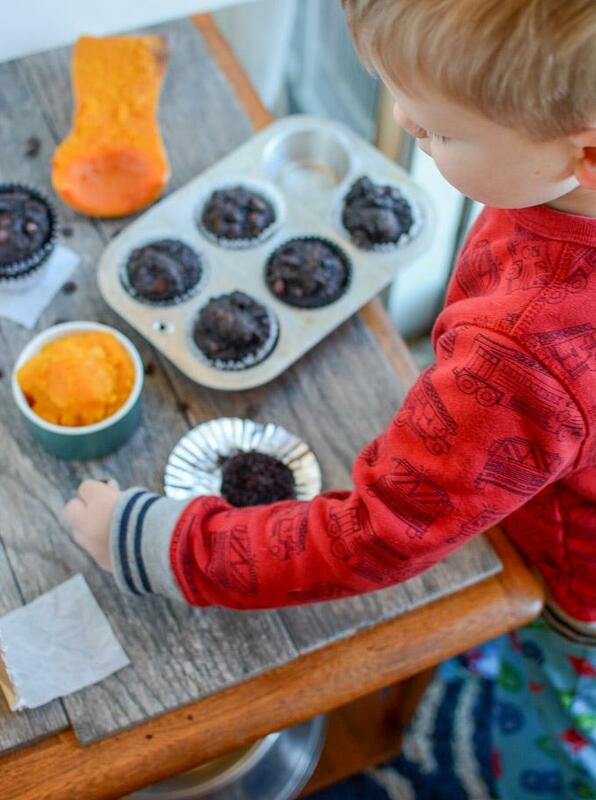 These Chocolate Squash Muffins have been a big hit lately, both with the kiddos and with the husband. 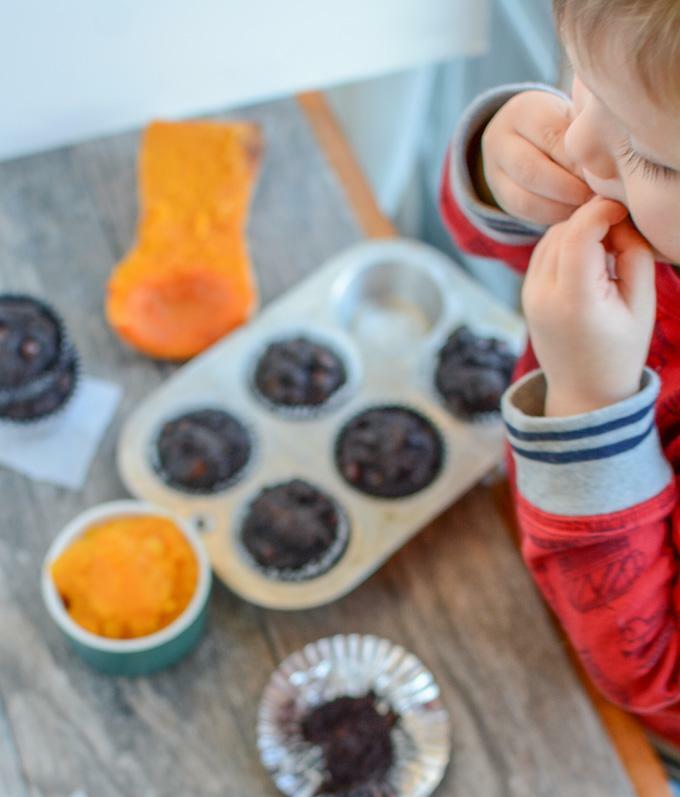 We’d gotten into the habit of buying a box of chocolate muffin mix every time we were at the store over the past month, so that Squish and I could “make muffins for daddy”. But honestly, they were pretty high in sugar and really more like a cupcake in my opinion. So I took it upon myself to give homemade chocolate muffins a try. And they turned out great! This was also part of a quest to 1) get my kids to eat more veggies and 2) create a recipe that included squash that my husband approved of. These muffins have just a few ingredients and are so easy. They do require a little planning since you need to roast the squash…but that’s super hands-off and can really be done any time. I use butternut squash and just slice it in half, scoop the seeds and roast it cut side down on a foil-lined baking sheet at 400 degrees F for 25-30 minutes or until it’s super soft and easy to pierce with a fork or knife. You could probably steam the squash if you were in a hurry! I think these work best with squash. Sweet potato would probably also work well. I also tried with pumpkin. They’re slightly more crumbly but still worked fine! These muffins are not overly sweet. If you want them extra sweet, increase the amount of sugar. I also tried these with both vegetable oil and melted butter and both worked fine. I make these in a bowl and just mash the squash really well with a fork…but you may still have a few small chunks of squash in your muffins. If you want them totally smooth, you can mix the ingredients up in a blender. Combine squash, egg, oil and sugar in a bowl and mix well. Add cocoa powder, baking soda and flour and stir until just combined. Spoon into greased or lined muffin tins and bake at 375 degrees F for 20-22 minutes. Pretty easy right? Hope you guys enjoy these! Squish had a great time helping me with my photo shoot for these. And I promise you’d never know there’s squash in these! Have you ever baked with squash? Love your recipes. Question – could a banana or apple sauce increase the sweetness? If so, do I need to decrease oil/butter? Can you tell I’m new at this? Yes, at 50 I’ve finally decided to cook/bake! You could try adding some applesauce or banana but you might need to add a bit more flour or i think they’ll be too moist. 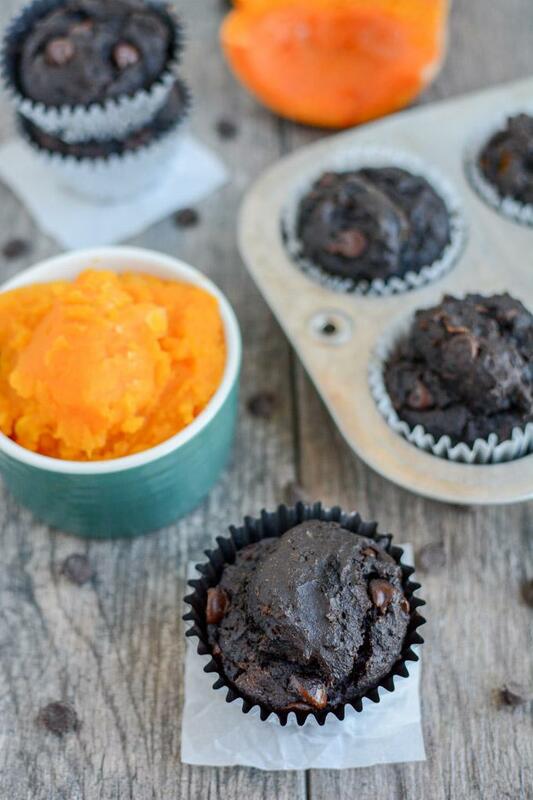 Can’t wait to try these – we just demolished a batch of your pumpkin gingerbread muffins. The only veggie I can get my 2-year old to eat at this point is sweet potatoes, so I’m always looking for ways to sneak them in! I also wanted to note – I had my son help me make your Easy Banana Oat Bars a few weeks ago. I think he enjoyed it! I used natural peanut butter and the consistency of the final product wasn’t quite right, but he had fun helping to mash the bananas and stir it all together. I’ve been enjoying the posts and Insta-stories about you cooking with Squish because it’s inspiring me to involve my son a little more in something I spend so much time on (cooking)! Thanks!! Do you think I could add zucchini to this as well and they would still come out good? as long as you squeeze the excess moisture out, i think it should work well! DO you thinks steamed butternut squash will work just as well as roasted Squash? Thanks! have you tried to freeze these or think they would be okay in the freezer for a short while? i haven’t tried but i think they would be! Wow! I like the twist of this recipe. 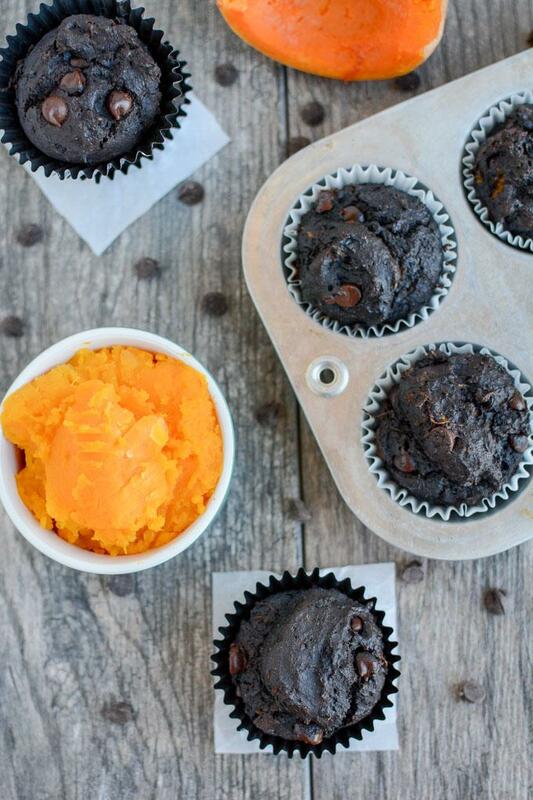 Instead of purely carb-rich muffins, a healthy beta-carotene rich squash is added. It’s both good for kids and adults! last night I popped the squash in the oven, scooped it out and had it ready. I threw the ingredients in a blender this morning and the house smelled amazing when the kids woke up. Once my girls were eating their yummy breakfast treat, I told them them the muffins had squash– they didn’t believe me! I know this will become a new family favorite. My girls gobbled them up with only 1/4 cup chocolate chips. so glad to hear they were a hit!! Do you think these will Freeze well? Trying with a can of pumpkin I have and might double the recipe to use the whole can. i haven’t tried freezing them yet but I think it would work! I just made these for my kids and they loved them. Do you ever add flax seeds to this? i add a few Tbsp of flax to almost all my muffins! I like these a lot! They are a treat that I don’t feel guilty about! I like coconut oil instead of vegetable oil.